Value is a funny thing. No matter how many reviews we write, I can never get the idea out of my head that the worth that anyone has for a bottle of whisk(e)y is always subjective. We try to give an idea of the value of a bottle based on its flavors divided by its price tag and it seems to be a solid way to give the most objective review that we can. There’s nothing worse than spending $200 (or more!) on a lack luster bottle that you purchased for a special event! And there are few better things that spending $60 on a bottle that brings joy to you and your friends. All of that said, today’s Scotch versus Scotch is a three way battle between some 18 year old offerings. In one corner we have a bottle from Costco, the Kirkland Highland 18 Sherry. 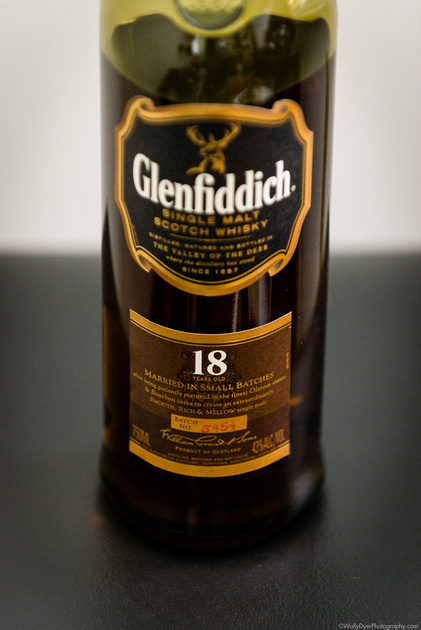 In the second corner we have a bottle of Glenfiddich 18. 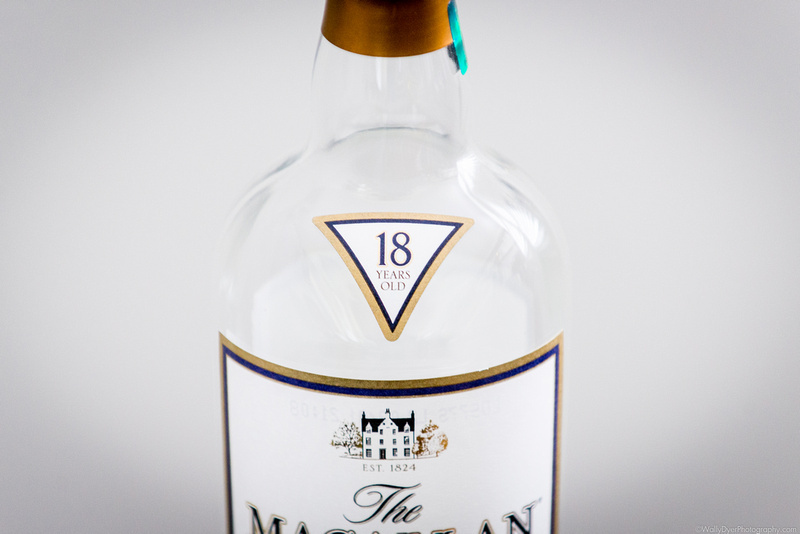 And in the third corner of our triangle shaped ring, we have the Macallan 18. Two of these offerings are finished in sherry and the Macallan is aged in sherry alone so this should be an interesting comparison. The price differential between these three bottles is also extreme so we’ll get a great idea of the value of each of these bottles. The Kirkland (bottled by Alexander Murray and Co) and the Macallan are almost identical in their slightly reddish golden hue. The Glenfiddich is noticeably a few shades lighter in color. 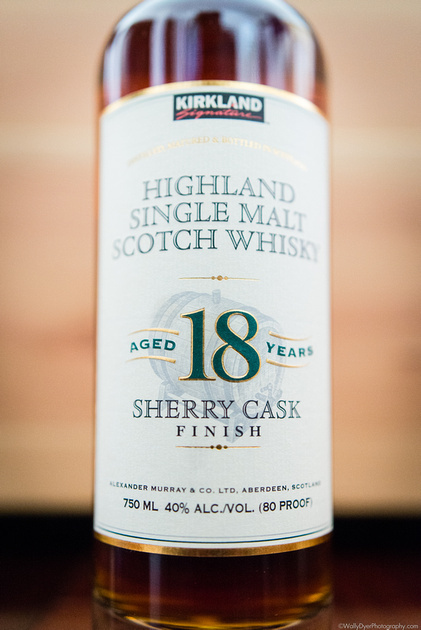 The Kirkland 18 Sherry cask smells like barley! Sherry barrels generally impart a nutty and spice filled flavor into the distillate they cradle and the barrels that AM&Co happened to pick for Costco are a pleasant deviation from the norm. There are also toffee notes strewn about the barley but they’re quite a bit more subtle than any typical whisky. The Glenfiddich has the fruitiest nose of the three… but that should come as not surprise to any Glenfiddich fans. Freshly sliced apples are drowning in sherry (sherry apple pie O.O) and soft baked tree fruits are sprinkled in small dashes of sugar! This is heaven! Ahhh, the Macallan 18. World famous for scotch lovers, it reeks of Sherry with bits of toasted oak. I know this bottle far too well. [Scotch] gifted me my first bottle last Christmas and I’ve already got a second replacement bottle for the inevitable demise of this liquid gold. In case you’ve never tasted this sherry and chocolate concoction, I’ll just leave a link to its previous review here. The Kirkland is light on the tongue with Sherry and barley! If you’ve ever had Korean barley water (보리차), you’ll find yourself right at home! There’s a bit of light fruit which is no surprise considering the distillery chosen to source the 18 year old hooch. There may be some grapes that are also present in the mix. Water brings up some unpleasant oak notes so if you’d like to enjoy this, like the Pappy Van Winkle 23, skip the water! As I bring the Glenfiddich towards my face to sip it, I’m immediately greeted by a bowl of fruit sugar! This pour is the most classy rendition of an apple pie in liquid form. From the soft, luscious baked apples to the cinnamon spices, it does not disappoint. I’d like to pair this with Thanksgiving this year. 🙂 Whichever casks they chose for batch 3454 all deserve a medal! 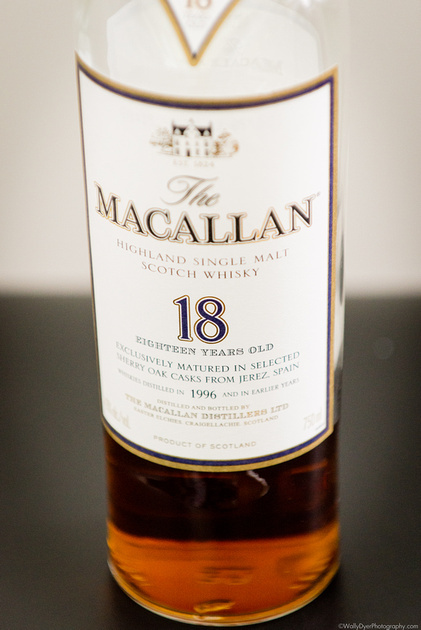 The richness of the Macallan 18s sherry and spices blast to the forefront of your tongue. It’s a small aria in Macallan’s opera of sherry (compared to the NAS cask strength) but along with sherry comes chocolate and oranges and even a touch of oak. Decadent. The Kirkland finish is sherry spicy with fruity notes. It’s definitely enjoyable as a sipper. The Glenfiddich finishes with oloroso spices and pepper… another solid offering from the valley of the deer. The Macallan lingers like an old friend just in from out of town. A best friend. 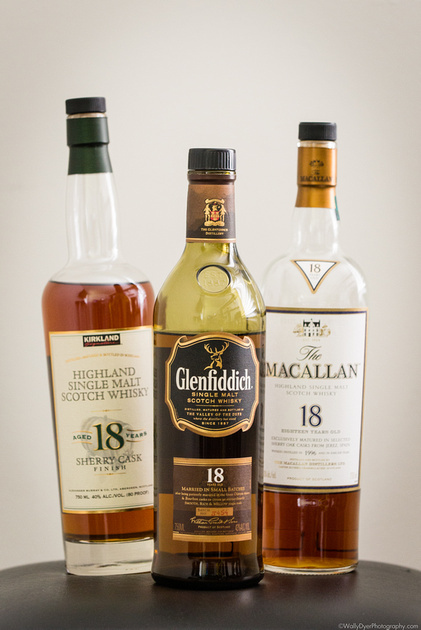 The Kirkland was $60 for the bottle, the Glenfiddich $80, and the Macallan $200. Not really a fair comparison when there’s more than a 300% difference in price between two of these bottles. That said, each of these bottles holds value for their respective audiences. The Macallan is something people can brag to their friends about trying. The Glenfiddich is something that can be shared with friends at home. And the Kirkland? Obviously a value at its price point and that’s more than admirable. I’ve tried all three and love them all but Kirkland’s new Speyside single malt 18 yr old with sherry cask finish is a dream at 60 dollars and beats them all for its rich notes and smooth sherry finish. I grabbed a bottle a few weeks ago and really need to do a comparison. AM&Co’s choice of bottling this time has such a wonderful mouthfeel and palate of flavors!